Following on the heels of the new Captain Marvel trailer, Marvel Studios is putting even more of a focus on their roster of female superheroes. Deadline reports ABC and Marvel TV are developing an hour-long drama series from Wonder Woman writer Allan Heinberg, centered on an all-woman team of lesser-known characters. 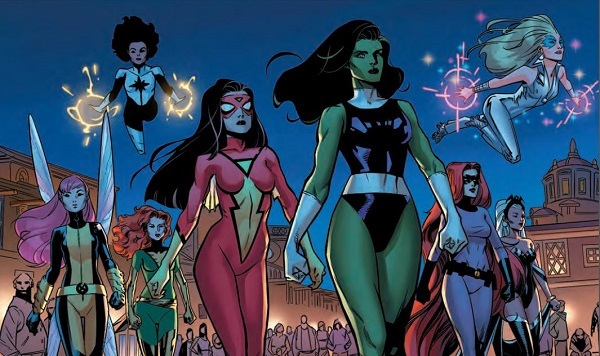 Details are being kept under wraps at this early stage, but this news brings to mind all of the recent talk about an all-female Avengers movie. While it seemed to have some steam early on with Tessa Thompson, Scarlett Johansson, Zoe Saldana, and other actresses really pushing for it, the idea has quietly faded. At this point there's no suggestion this new TV series would feature any characters previously seen, and I'm guessing it probably won't. I'd kill for it to be a Lady Liberators series, though. Just sayin'. And She-Hulk has to be a part of this, right? Between this news and Marvel shows on Disney's streaming service there's going to be more superheroes on the small screen than ever.